Harrisburg – Secretary of the Commonwealth Carol Aichele today announced a new, simplified process for people born in Pennsylvania to get a non-driver photo ID card for voting purposes if they lack an acceptable alternative ID. This innovative system, now in place, can certify the birth records of Pennsylvania natives without the need for them to purchase a duplicate birth certificate with a raised seal. Individuals must visit a PennDOT drivers license center and submit the necessary information. The information will then be forwarded to the Department of Health, which maintains birth records. Once it is verified that the individual’s birth record is on file, applicants will be notified by mail when to pick up the non-driver photo ID card for voting purposes. The process, which is free, is expected to take about 10 days. “The security measures protect the privacy of the person applying for the photo ID, and uphold the purpose of the voter ID law and help poll workers accurately verify the identity of every voter,’’ Aichele said. Aichele commended the Department of Health and PennDOT for cooperating with the Department of State to develop this method of securely verifying birth records. “Our voter ID law is intended to allow all eligible voters to cast ballots, but prevent those votes from being cancelled by illegally cast ballots,” Aichele added. 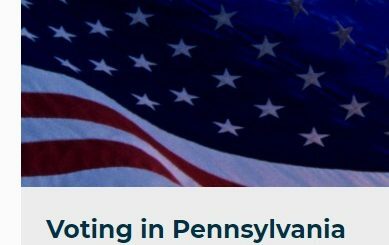 Anyone who purchased a Pennsylvania birth certificate for voter ID purposes after March 14, 2012, can apply for a refund by visiting one of the Pennsylvania Department of Health’s six regional offices. For more information, visit www.health.state.pa.us, under the “Birth and Death Certificates” tab. To be eligible for a refund, you must show proof that a birth certificate was purchased after the date the Voter ID law went into effect, as well as the photo ID obtained from PennDOT. Anyone who holds a Pennsylvania driver’s license or non-driver photo ID that has expired since 1990 does not need any proof of ID or residence to get a photo ID for voting. People need only give their name to a PennDOT customer service representative and indicate they have an expired license. For identification issues, call PennDOT’s customer care center at 1-800-932-4600. Information on the voter ID law is available at www.votesPA.com, or by calling 1-877-VOTESPA (1-877-868-3772).